Time and time again studies have shown the benefits of smiling. We all feel better when we can comfortably smile because we are confident in the way our smile looks. Part of feeling confident with your smile is having white teeth. This is why teeth whitening has become a very popular product and service. If you are looking for whiter teeth you have come to the right place. At Montana Roots Dental Care we have several professional teeth whitening options for you to choose from. We provide two main types of teeth whitening: in-office, and take-home. In-office teeth whitening is performed in our office here and is administered by a member of our highly-trained staff. Generally, in-office teeth whitening tend to produce better results because we are able to use higher-concentration bleaching gels. The time that it takes to do in-office teeth whitening ranges from about 15-30 minutes depending on the specific method selected. For more information on what options we would recommend for your particular case please contact us, or call our office at all (406) 442-0282. 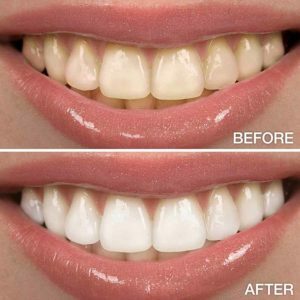 Take-home teeth whitening is a do-it-yourself alternative to professional whitening. You can buy a variety of at-home whitening products online and at your local pharmacy. Another option for you is to purchase an at-home whitening kit through Montana Roots Dental Care. The products that we provide have a higher concentration of hydrogen peroxide (the primary bleaching ingredient). The process for at-home whitening kits may vary slightly depending on the specific product you purchase. But in general, it involves bleach trays or strips that hold the whitening gel to your teeth. Trays are kept in for 15-minutes to 1-hour. The biggest difference between take-home and in-office whitening is the level of concentration of the bleaching ingredient. Keep in mind, there is a difference in the results you will see from professional whitening and at-home teeth whitening. Who Should Not Bleach Their Teeth? Teeth whitening is an acceptable and safe procedure for everyone. However, bleaching does have one side effect, increased teeth sensitivity. If you naturally have sensitive teeth or have sensitivity to hot and cold liquids bleaching might not be the best idea for you. This is because it will likely make your sensitivity worse. The best way to maintain your white, healthy smile is to use proper home care on a regular basis, which consists of brushing and flossing daily. If I Keep The Bleaching Trays In Longer Will It Make My Teeth Whiter? The short answer is no. It is important to follow the instructions for the product you use to whiten your teeth. In general, bleaching trays are kept in for 15-minutes to 1-hour. Leaving them in longer than the prescribed time (for example, leaving them in overnight) does not help make your teeth whiter. Yes, teeth whitening is safe, and the only known side effect of teeth whitening is increased tooth sensitivity. Keep in mind, there are no studies about the safety of whitening during pregnancy or breastfeeding. How Much Whiter Will My Teeth Be After Whitening? It depends. Everyone has different teeth, and the starting color of people’s teeth varies. It is difficult to predict how much whiter your teeth will be after whitening. The best way to find out is to try it! Lastly, keep in mind that professional in-office teeth whitening leads to better results than at home options. The cost of teeth whitening is variable depending on the type of whitening you use. At-home kits are going to be more inexpensive than professional in-office whitening, but the results may be less desirable with some of the cheaper options. While the cost of at-home cost of teeth whitening can be very inexpensive, the cost of professional teeth whitening can range from $250-$500. Is whitening covered by insurance? No. Teeth whitening is an elective procedure, so there are virtually no insurance companies that cover it.